Fascism, at its core, is based around a desire for supreme order on a mass scale, with invariably horrific results; Surrealism is a direct attack on order. It is, therefore, unsurprising that surrealist art emerges from extreme repression and the violence that comes along with fascist ideologies. We need look no further than Picasso’s emphatic Guernica to see this. The fact that the king of surrealism, Salvador Dalí, was somewhat of a fascist himself is a suitably unnerving anomaly. At a time when fascism in Egypt is once again rife, the Surrealism in Egypt exhibition at Tate Liverpool feels very pertinent indeed. The exhibition focuses on the radical Art and Liberty Group that centred around Cairo in the 1930s and 40s. The paintings, photographs and films on show depict a country in flux, caught between wars, and trying to find its way as an independent country, while still under official British rule. One of the largest and most powerful paintings in the exhibition, Mayo’s Coup De Bâtons (title image), seems like an apotheosis of these chaotic times. The canvas shows a tumultuous garden scene, a web of contorted figures connected by a series of squiggly limbs, backgrounded by a glaringly out of place table, chair and upturned wine bottle. 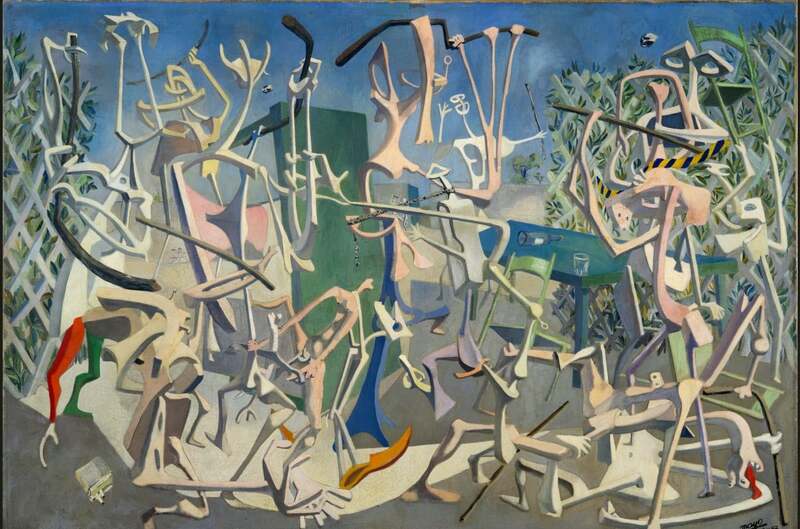 There is certainly something violent going on, grabbing and kicking and twisting, but the pale shades and elastic stick figures give the painting a sense of silliness, subverting the underlying aggression. It is a confounding dichotomy. And this not the only instance of a kind of nefarious silliness that permeates through the exhibition. The absurdity continues with Abdel Hadi Al Gazzar’s The Beloved of Il-Sayid, depicting a lizard’s long, thorny tongue, almost like a bloody bicycle chain, stretching the length of the canvas, through the mouths of two indifferent faces and into the eye of another. The subjects of the painting have an odd dignity about them, the eyes of the rightmost face staring directly at the viewer, as if attempting to communicate in some way. 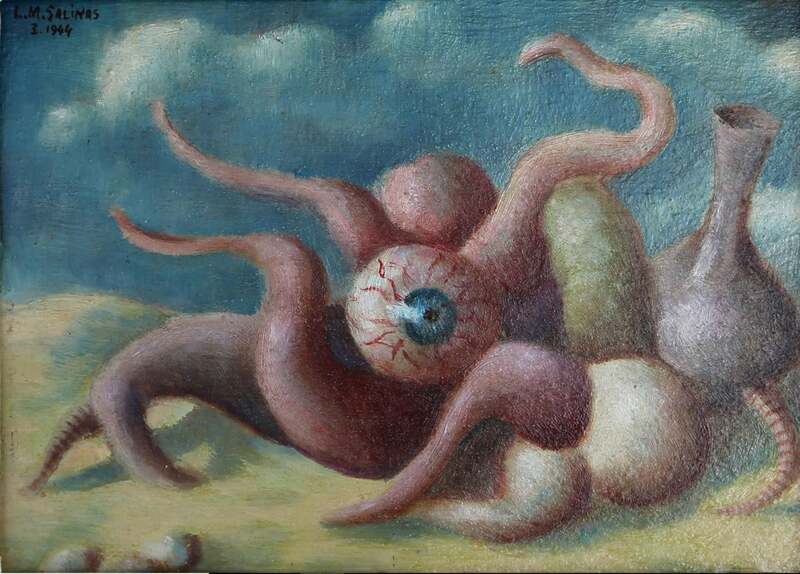 Amongst these curiosities, a theme of nakedness and deformity dominates the walls; bodies fleeing in fear, sinking into gloopy mires, legs in the place of arms, tree-people and octopuses with eyeballs for heads. Many of these paintings have an essence of anarchy, pain, and upheaval in the face of suffering, and it’s clear that the artists on show have a strong sense of surrealism as a revolutionary movement. But it’s the exhibition’s more subtle and tender moments that really stand out. 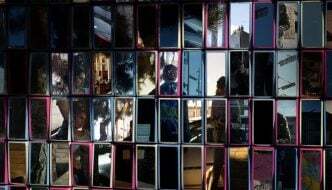 The work of Amy Nimr, for instance, has a distinct dark sensitivity to it. 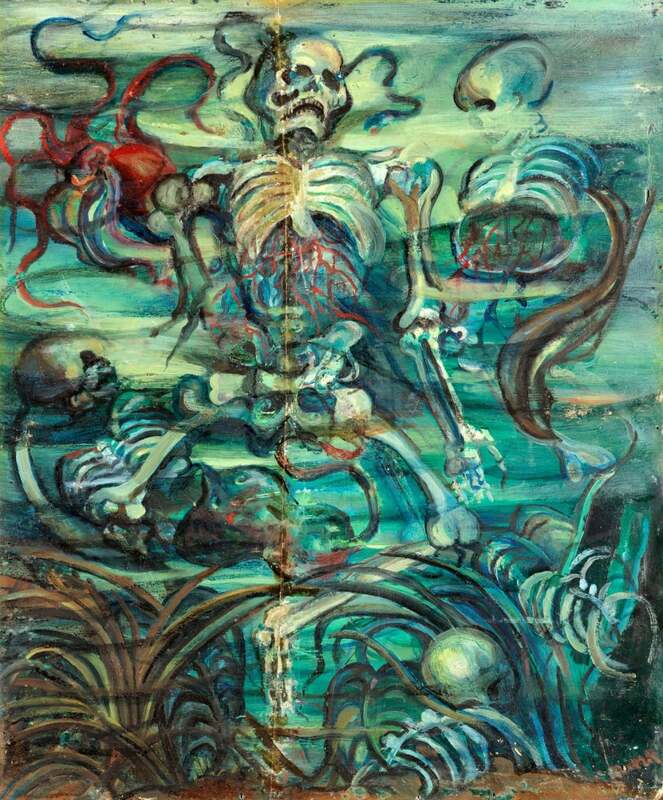 Nimr was focussed on an underwater series throughout the late 30s, but when her son died when a camouflaged bomb exploded in his hands, her work took on a macabre effect, as can be seen with Untitled (Underwater Skeleton). The interplay of blues, blacks and greys drift across the grimacing skeleton and the deformed reflections that surround it, creating a hellish impression. 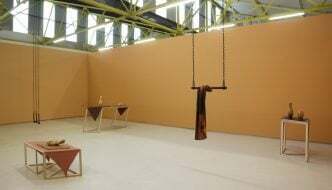 In the last room of the exhibition, Ibrahim Massouda’s Adam Eve hangs, seeming slightly understated compared to many of the preceding paintings. It is also one of the more recent pieces, dated 1950, and it is much sparser in style, more impressionistic than surreal. Adam kneels before Eve, the two of them framed beneath a stormy sky, clouds blending into water blending into trees. Adam’s pose illustrates the veneration of the female, a theme of many of the paintings in the exhibition, but the nightmarish blur of Eden suggests a more sinister, wrathful aspect. There are so many contrasting elements at play in this exhibition that it is difficult to sum up. There are features explaining the movement’s wider reach, with the photographs of Lee Miller providing some useful international context. But the paintings seem closely tied to the culture from which they emerged, some of them even being reminiscent of ancient Egyptian art, hinting at a subconscious artistic lineage. 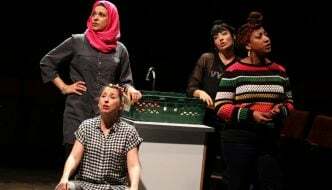 One wonders whether there will be a new artistic movement that burgeons from the country’s current state of affairs, and whether it will be given the chance to flourish. Surrealism in Egypt: Art et Liberté 1938-1948 at Tate Liverpool is closing on March 18th.